A few Saturdays ago, I spent the morning at Recess Dumbo -- such a great kids' play space! -- with Vicks® VapoRub™. Fellow influencers and I learned about how we can best fight sickness this time of year (and if your house is anything like mine, this is vital information). My family and I suffered a ton with coughs and colds this winter. UGH. First, we all know that washing our hands multiple times throughout the day is important, but it can be a challenge to get our kids to wash as thoroughly as they should (or maybe that's just my kids!) One tip suggested by the speaker (a pediatric nurse), was to have your child sing "Twinkle Twinkle Little Star" while they wash. By the time they get to the end of the song (about 27 seconds or so), they'll have washed an appropriate amount of time to rid themselves of germs, which as we know, are EVERYWHERE. I thought that was a great suggestion! Vicks® VapoRub™ is also an important step in soothing coughs all year long, frankly - summer colds are the worst! The topical ointment with medicated vapors is appropriate for ages 2+ and the vapors last up to 8 hours. I've found the perfect time to administer it is right before bedtime, as the soothing action of rubbing the ointment on your child's chest area is a nice way to calm them down before it's time to sleep. The scent itself is refreshing and calming, and honestly it takes me back to my own childhood when my mother would rub it on my chest during a coughing fit! Life has a way of coming full circle, right? 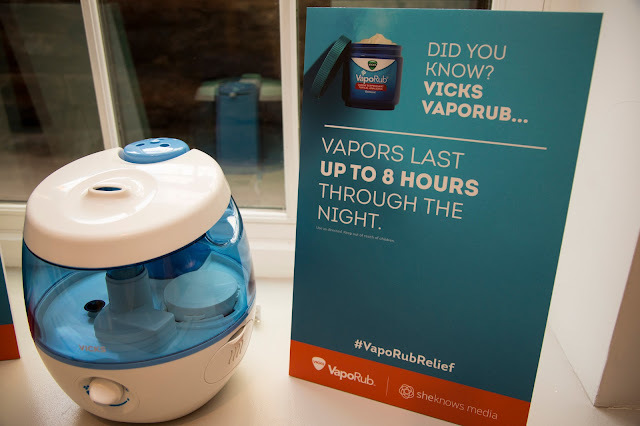 Thanks to Vicks® VapoRub™ for hosting such an informative morning! Coughs & colds, you don't have anything on me. I'll be ready the next time you infiltrate my home (which given our luck and with two children in school, should be in about a week). At least this time I'll be prepared. Disclosure: Compensation was provided by SheKnows Media for the purposes of event attendance and review. All opinions are my own. Marcy LOVES the pictures I have in the kitchen of your girls (on Christmas cards). She just smiles and talks to them every time she sees them. :) We just love your sweet family!